When I got this topic I knew that Dr. Siddharth and Dr. Venkata Ram have really put a task in front of me, so I just changed from elasticity to stiffness and from vascular function to endothelial function and then because predominantly, of course, I look after very critical patients and do limited invasive work, my work predominantly is in the field of early detection and prevention, I thought that I just put it to together, because all of us are physicians, all of us see hypertension patients, it is number one risk factor for coronary artery disease for strokes and so many other things. Also, what I have tried to do, and I hope you all will appreciate, that we basically kept to our own data, our own circumstances. The world wide causes of death secondary to coronary disease very clear, this is cardiovascular disease as Dr. Shah said, that there are millions of people, literally millions of people in our country, who have hypertension and therefore naturally coronary artery disease is one of the key points. This is old data but this is phenomenal data that already 2 years ago we had the biggest volume of acute coronary syndrome patients in our country and if you look at this data there are certain factors which I am not going to speak right now, but it does point to the fact that with the growing number of risk factors of which hypertension is one of them this burden is not going to decrease. Earlier onset of CVD has already been alluded to, Dr. Venkata Ram said that the uncle was 40 years old and the nephew was 21 years old, common features, we all know about this. This is so common in our country and then to make matters worse we have the metabolic syndrome, truncal obesity, IFG, increased TG, atherogenic cardiovascular atheroma, hypertension all these are very well known, but look at the problems that we have in defining these things. First of all we looked at our own data of high prevalence of metabolic syndrome in office executives and the data was amazing that in the year 2000, 37.5%, by the year 2005 43% people actually had metabolic syndrome. Mind you, these are well to do people who know about cardiac disease, about morbidity and mortality, people who run major industries. Then comes the point, what are we trying to prevent, how to prevent CVD, and this is how it occurs that we have multiplicity of risk factors and these are all contributing in some way to coronary artery disease to PAD and this is my duty today is to put these 2 things together, are we missing something in between. Before I come to that, look at the problems that we have. There are actually no guidelines from the Cardiological Society of India, otherwise how do we really assess a cardiovascular risk in a given individual. The conventional risk assessment methods grossly underestimate CV risks in Indians. This is an article that was published in JAPI not so far back that FRS uniformly across the board doesn’t help us in that respect. If you look at this study of almost 2000 asymptomatic office executives, if you just look at the age, because FRS puts a lot of emphasis on age, you will find that if you looked at conventional Framingham Risk Score, a majority of these individual would not even come into being that yes they require some help and it is unusually low in young patients. To make matters worse is that there are people who have none of the risk factors, but they develop CAD and there are many patients who have all the risk factors but don’t develop CAD. So, what are we missing here? What we are missing here is that the person who started with the definition of metabolic syndrome even he is saying, is this a useful concept or a clinical tool? So, we start with questions, we start with the fact that we have risk factors, we have disease, we don’t know what is happening in between and therefore in the next 10-15 minutes that’s what I will try to do. What we are doing in hospital based practice is that we have hypertension, dyslipidemia, diabetes, insulin, but we are seeing people when they come with MI and that is fine. The command centers are full, CCUs are full, and angioplasties are taking place. There are centers after centers who claim their balloon to cath lab time is less than 90 minutes and there is a big debate about it. How good they are doing. How many people can afford it is a totally different story. But if you look closely on this Cardiovascular Continuum by Zhao and Braunwald, these are steps that we are missing. We never look at the endothelial function, we never look at atherosclerosis, we never look at disease developing early, but we were totally content when people came to us with either angina or with acute myocardial infarction and if we miss that than of course you have arrhythmias, sudden death, cardiac remodeling, ventricular dilatation, and you know as you go step by step the things become worse and worse and things become much worse for the patient. So, these were the three things that we were missing and this is what truly I have been asked to talk about, arterial stiffness and endothelial dysfunction. My life’s work is on IMT, but here I am talking about brachial artery flow mediated vasodilatation, pulse wave velocity, so there has to be a paradigm shift from assessment of vascular complications. If you look at a strongly positive TMT, a hypertensive walks in and you say well you must risk stratify. He has a strongly positive TMT and then you take him to the cath table and say you have got disease, it is like saying that we discovered pregnancy in the labor room, of course, but there has to be a paradigm shift that we will start looking at abnormal vascular health. Whether it is a metabolic syndrome patient, whether he has diabetes, whether he has hypertension and if that thinking comes in mind that look, I don’t care this person is either going to have a stroke, PAD or a coronary artery disease then our meeting is useless. First is to look at the elasticity and this is amazing that elasticity and endothelial dysfunction go hand in hand. We started this work almost 15 years ago when people used to snigger at my back and say we don’t know what the old man is doing, but this is how this work has again come back in prominence. Brachial artery flow mediated vasodilation tells you about vascular function. It is the first test which tells you about vascular function. Simple test, put on a BP instrument, the patient is off beta blockers, smoking, is fasting, comes resting to you, cuff occlusion arm or forearm, no flow so you have created ischemia in the distal vessels for 5 minutes, you let it go, there is a reactive hyperemia. What happens then is that nitric oxide is secreted in the endothelial cells and if your endothelium is perfect, you will have dilatation more than 8% of the normal, if not, you have endothelial dysfunction. You have abnormal vascular health. So, you have already picked up the first sign of disease, at which level you can actually modify or start modifying the disease. Flow-mediated vasodilatation has come back in a big way. Knowing the fact that it is cumbersome, it requires training, it requires echocardiography, we worked with a company from America, Everist Genomics. This is a computer based technique and you can do it even in the rural areas without the use of a 7.5 mHz transducer placed on the person's cuff. This is the Angiodefender. The first study in the world was done at our center and we have had a very good correlation between FMD done by the echo and that done by the Angiodefender and it gives you a very good write out. It is a 20-minute test and it will tell whether the patient has enough nitric oxide. If he is a patient of hypertension, he already has endothelial dysfunction, you know, he is going to have a problem and the correlation between BFMD and Angiodefender are extremely good. What is it useful for, flow-mediated vasodilatation. You can predict future risk of CV events. I am not saying that, I will show you data which is amazing. Assessing efficacy of anti-atherosclerotic therapy and clinical research. Now, the study which everybody is talking about is the MESA study (Multi-Ethnic Study of Atherosclerosis) in which in a nested case control study they found that those who had reduced BAFMD, and this was done by the conventional method, that if you had endothelial dysfunction then you had higher propensity to get CVD events. CVD is a broad term which includes cerebrovascular as well as cardiovascular disease and see how the graphs starts parting so earlier on. These are those who have normal FMDs and these are those who have already got endothelial dysfunction. Those of you who are interested there is a huge data, called the Young Fence study, 30 years followup data. Those whose function was fine whether they had all 9 risk factors did not develop coronary artery disease that is the power of FMD. Incremental value whether you look at the p values you will see that there is a huge incremental value of the use of FMD over and above. This work we had actually done many many years ago, in 2003, and this was then recapitulated in San Antonio Study also, where they said that the 7 year incidence of cardiovascular events was the same in people who have diabetes and those who have had the first myocardial infarction and this is what we found. Group I only CAD, group II only diabetes and no CAD, group III only CAD. So, it is no surprise that those who had diabetes but no CAD had larger 7 year incidence of coronary artery disease. This was just found in mean FMD study. There are others who have who said, deleterious impact of high normal glucose and other metabolic syndrome components and hypertension is a huge component of the metabolic syndrome on arterial function and endothelial function and the intima-medial thickness. This is a very good study called the CATHAY study. Now, once you have crossed that level that the person actually has endothelial dysfunction then you should, and in our institution we do arterial stiffness routinely. As somebody said, is it a practice? Yes, it is. Even our executive packages have intima-medial thickness and arterial stiffness inbuilt into that. Let me tell you a word about arterial stiffness. There is a huge work going on. Now people are recognizing something that we started years ago. What is arterial stiffness. Young compliant arteries, you see the velocity is 8 mm/sec, and this is how it occurs. This is a compliant vessel, in systole it expands, in diastole it comes back and then this is nice pressure curve that you get and what happens here is that this beam goes from in systole and it returns from the periphery in diastole and this is what happens in diastole, and diastole is extremely important because diastole is where coronary artery get filled. So, this reflected wave comes, goes back if your arteries are compliant, and this is what Dr. Satyavan Sharma was saying, you are young old, or older old or old old, it all depends upon your vascular stiffness and your endothelial function. So this is how it occurs. If you have compliant arteries your chronological age does not matter. Now, you look at it, what happens if you have got arterial stiffness and this may be if your age 30, doesn’t matter. If you are hypertensive, metabolic, big time cigarette smoker, then this is what will happen to you that the wave goes in systole, the arteries are now thick, they are noncompliant, comes back in systole and therefore you get a ventricular vascular mismatch. The reflected wave actually increases or augments your central blood pressure, what do you get? You get ISH. That’s the basis of ISH. So, it increases vascular afterload with the propensity to develop left ventricular hypertrophy, decreases coronary perfusion pressure, increases myocardial oxygen demand, increases flow turbulence, endothelial dysfunction and atherogenesis. So, if you have just these 2 parameters, that means you looked at the endothelium of the person and you have looked at arterial stiffness and we have an instrument called the Periscope which is vascular tonometry and we have been able to measure arterial stiffness with that. This gives central aortic pressure. A question was asked what is central aortic pressure? Central aortic pressure is extremely important. I will tell you how that is. This is the pulse wave velocity and I have already spoken to you about it, waveform at common carotid artery, waveform at the femoral artery and this is called the pulse wave velocity. If it is over 900 cm/second then you have arterial stiffness and it is also related to carotid intima-medial thickness and both these are strong markers of CAD, then either parameter are low, but what I wanted to tell you, all pulse wave velocity is that many antihypertensive agents will decrease systolic blood pressure and diastolic blood pressure as measured peripherally, but you find that another agent that do not cause so much decrease in stroke and CAD and that is because they are not affecting the central aortic pressure. So, the drugs that affect the central aortic pressure of which 2 that come to my mind often are amlodipine and perindopril and they have been extensively studied. 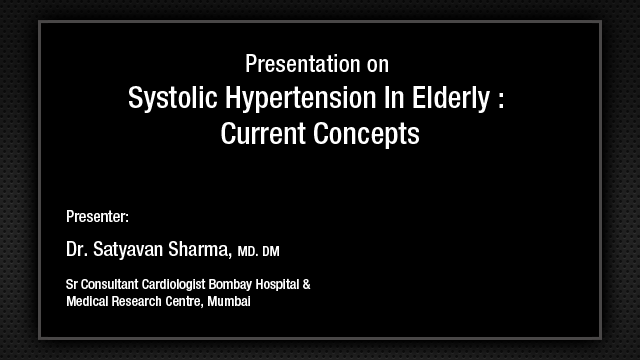 We have done work on that extensively abroad and that is the reason why this study from the young to HYVET study where they took average 80-85 year old people they decrease CV risk in hypertension metabolic patients because of the use of these drugs. So, this is the ASCOT study, reflect all clinical outcomes, amazing. What is the difference, the CAFÉ study which was a sub study of the ASCOT trial, so many patients were recruited compared clinical outcomes with regimes bases on atenolol with or without diuretic and amlodipine with perindopril and this is the differential effect of various drugs on aortic BP. So, if you have a simple thing such as a Periscope, which is anyways the best methodology of recording blood pressure. I can tell you there is nothing on earth which can give you better BP recording. This we found that amlodipine plus Coverysl was better than a beta blocker-diuretic combination. Which brings us to a point that are we just happy taking the blood pressure of a patient saying, oh look, you are now at 130/80. Well, he may be at 130/80, now what is happening to his endothelial function, what is happening to his arterial stiffness those are the 2 important things. So, the message from the CAFÉ trial was greater reduction in central aortic pressure with amlodipine plus perindopril could have been responsible for better clinical outcomes, so the augmentation index is very important. Many times, peripheral pressure may be normal, augmentation is still high and mind you sometimes reverse can be true as well. Many people after your antihypertensive therapy may say look I am sorry, I can't function, I can't get up." You take his blood pressure, the blood pressure is only 130/80, you say, you are fine, but you have actually reduced his central aortic pressure to such an extent that the person has become dysfunctional. So, there are a lot of things that you can do. 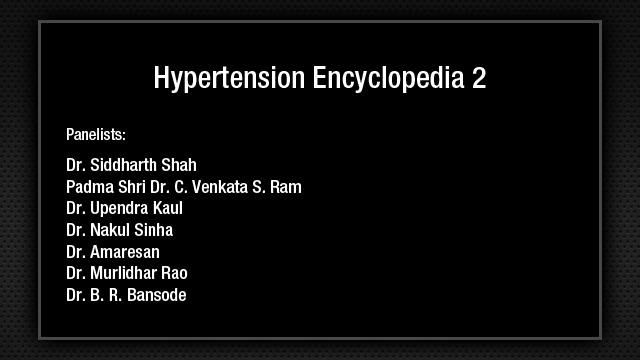 So, there is relationship of arterial stiffness with hypertension and its management in north Indian urban population free of cardiovascular disease. This was the first article which appeared in our journal and we found a very close correlation. Assessment of arterial stiffness may thus be helpful in tracking vasculo-protective effects of antihypertensive therapy in clinical practice. A large majority of these patients also had the metabolic syndrome and the European Society of Hypertension does recognize aortic blood pressure as an important element in the proper control of hypertension. So, this is the expert consensus document on arterial stiffness. I think in the United States of America now it is being recognized, but the Europeans and this gentleman, Dr. John Cockcroft who was with us a year ago and amazing work that is being done in his center in England. Metabolic syndrome and age-related progression of aortic stenosis. What I have said brings us to this fact that yes, the patients and their rising incidence of metabolic syndrome in our country, so aortic stiffness is going to be talked about. It is going to become important and as noninvasive tool an important thing. Influence of metabolic syndrome on arterial stiffness, this is the famous Bogalusa study, again brings to the same point that you have to go beyond just taking blood pressure, which is extremely important, but then in those who are at higher risk you have to go a little beyond all this. So, ladies and gentleman and Mr. Chairman, I can't keep away from talking about prediction and prevention of heart disease and I take this quote from Dr. Prediman Shah, Screening Asymptomatic Subject for Subclinical Atherosclerosis and these are two prime elements of subclinical atherosclerosis, the answer to this question, yes we can, it does matter and we should do it because there is a larger body of published evidence which supports the incremental value of these noninvasive imaging guided risk assessment techniques over and above the FRS and more so it is true in Indians where we have heart disease, hypertension in as low as 20 to 30 years of age. Not coarctation or not secondary but actually related to lifestyle measures and better matching of intensity of prevention to expected risk will take place if we follow this. So, Mr. Chairman, ladies and gentleman I think, "An ounce of prevention is worth a pound of cure" and I bring you greetings from Medanta - The Medicity. Dr Sudhir Vaishnav: Dr. Kasliwal, is there any sort of interventional study done, because you showed the missing link, you showed the Angiodefender is useful in picking up this arterial stiffness or endothelial dysfunction, but have you done any interventional studies to show that it can translate into better outcome? Dr. R. R. Kasliwal: There are several interventional studies. One of the studies that we have done is to show the clear value of impaired FMD because they work in inverse ratio to coronary artery disease. One can't quote all the papers, but there is a clear relationship. If that is so and there are risk factors then CVD risk is incrementally high, if I understand your question correctly. 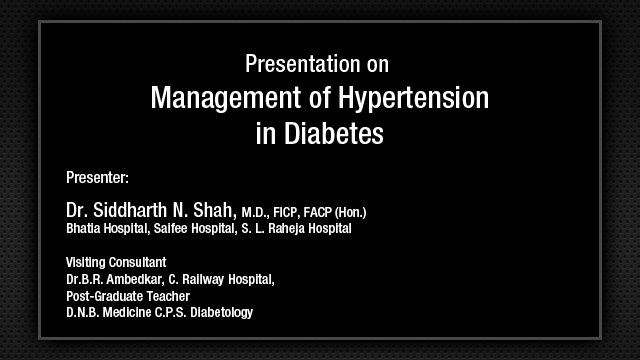 Dr Sudhir Vaishnav: What interventional treatment do you start on this patient? Is it statin, is it amlodipine, is it nitrates? Dr. R. R. Kasliwal: The first thing that we start really is to go back to the basics and talk to people about lifestyle management and I tell you when we talk about lifestyle management, it is just not a 5-minute pep talk, you must walk 4 km and do yoga, but there is actually an element in our institution where people will sit with them, tell them the exercises according to their lifestyle. If somebody says look I work 10 hours a day, I go in the ride, I can't do all these thing. Then something is tailored to that need. There is a lot of influence on lifestyle and then added to that we look at hypertension for example and we take lot of use of ambulatory blood pressure monitoring and definitely start the use of good ACE inhibitors and definitely use statins. You will be surprised that many people whose parents are actually undergoing a procedure they will come in droves and say look my dad is just 45-50, I don’t want to be in that, they are much more cognizable to the fact. Dr Apoorva Vasavada: All these studies regarding the central aortic pressure and vascular stiffness are focusing mostly on coronary outcomes, but is it not more important that these kind of hypertension affects the cerebrovascular outcome and the heart failure incidence more. Especially, there are a lot of patients with those vasculo-renal cardiac syndrome coming with flash pulmonary edemas. They are the patients probably directly related to this syndrome. Dr. R. R. Kasliwal: True, but what the aortic stiffness gives you is actually related to hypertension and is related to arterial stiffness, which is one of the fundamental parameters of actually disease to come, that’s why our focus is just at the bottom of the continuum. Dr Venkata Ram: What Apoorva has asked is a very important question. There are some data now, Ravi might know, that actually whenever there is increased pulse wave velocity, increased central aortic pressure, there are abnormalities in gray matter on MRI imaging of the brain. So, this could be lacunar infarcts. This is very very fascinating question, how the target organ damage can occur? Looking at the biophysical thing, this is very very important. Your question Apoorva was very good. Dr. R. R. Kasliwal: I just wanted to mention this that one of my friends from Kings College has actually done a correlation between this and cognitive disorders because in a small country like Britain, they are spending, I don’t know, how many billion pounds, because it is the NHS working people just on people hypertensive. They have to send nurses home just to make them sign otherwise they are absolutely normal people and also we have started to now work on it. These two modalities actually work on Alzheimers and say look can we actually pre-pone it. So, huge things are happening below this curve. From 1 and 2 level lot of work is being done. Dr Venkata Ram : Recently, again in continuation with beautiful description by Dr. Kasliwal that exercise cardiologist, all of you see this exercise induced hypertension but the recovery time for normal blood pressure is greater in people who have increased pulse wave velocity, central aortic pressure. So, what we think is it is taking more time for the blood pressure to recover, actually is a very good clue that the total biophysical complications of hypertension have already occurred. Very interesting for future. Unfortunately, as Ravi said guidelines are not pushing for it because there are other considerations, political also. Question from Audience: Sir ,you just mentioned that sometimes the peripheral blood pressure can be very good like 130/80 and still the patient feels very uncomfortable because of a drop in his central aortic pressure. How can we judge clinically whether to reduce the dosage or how to go about it? Dr. R. R. Kasliwal: Definitely, many a times, even without central aortic pressure, if I find my patient is not comfortable at 125-130, I decrease the antihypertensives. Look, this is what Dr. Venkata Ram is saying, guidelines or no guidelines we also work at a clinical level you we know the patients, what they do, what kind of activities they do. Sometimes, you just have to accept it. Not nonscientifically, but that is the call for that particular patient. We try to get everybody's blood pressure down to 140/80, do we succeed in clinical practice, no we don’t. That doesn’t mean we don’t recognize the guidelines, but we recognize the fact that there is so much in the community at large which we have to live up with.